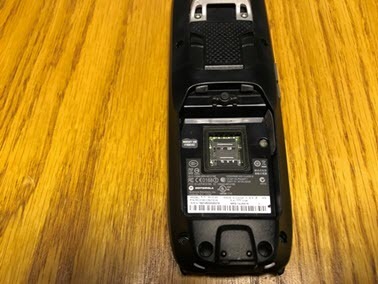 The Motorola/Zebra MC2180 inventory scanner increases both the speed and accuracy of inventory counts. 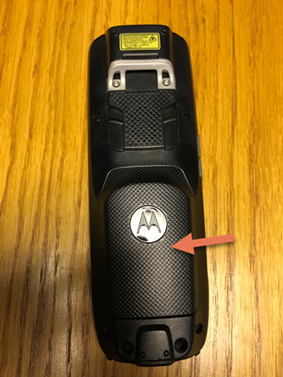 Sherpa Tip: The scanner must be charged for 24 hours before the first use. Connect the USB sync cable to the back of the cradle. Plug the other end of the USB cable into the back of the computer. 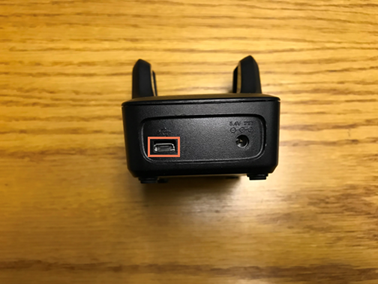 Sherpa Tip: Other USB ports (e.g. 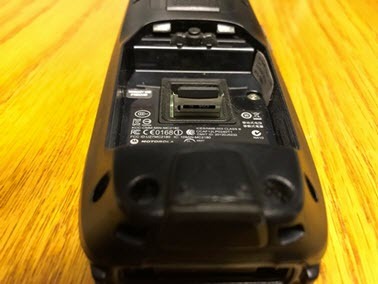 on the computer monitor, the front of the computer, a USB hub) may not receive sufficient power for the device. Plug the power cord into the back of the cradle. Plug the power cord into the wall. SherpaTip: Do not use greater than a 32 GB microSD card. Pull up on the latches on either side of the laser to release the battery compartment panel. Slide the card cage down until it releases. Insert the SD card with the label side facing up. Slide the card cage up until it locks. A "click" sound indicates when the cage is properly secured. The battery is integrated into the battery compartment panel - simply insert the battery in the compartment. Sherpa Tip: The installation process can take up to 30 minutes to complete. Do not remove the scanner from the cradle until the installation is complete. Download the AscendScan software (available on www.ascendrms.com). Click the Start menu and search for Turn Windows features on or off. 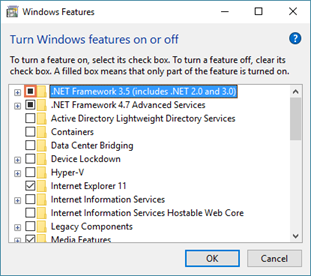 From the Turn Windows features on or off dialog box, check .NET Framework 3.5 (includes .NET 2.0 and 3.0). From the Windows needs files from Windows Update to finish installing some features dialog box, click Download files from Windows Update. From the Windows completed the requested changes dialog box, clock Close. Right click the AscendScan installer. From the displayed menu, select Run as Administrator. The AscendScan Installation Wizard displays. Welcome to the AscendScan Installation Wizard: Click Next. 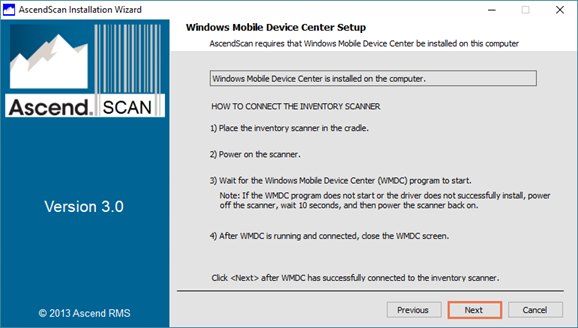 Check Overwrite Any Existing AscendScan Files And Previous AscendScan Configurations and click Next. If required, turn on the scanner by pressing the power button once. Do not hold the power button. Place the scanner in the cradle. 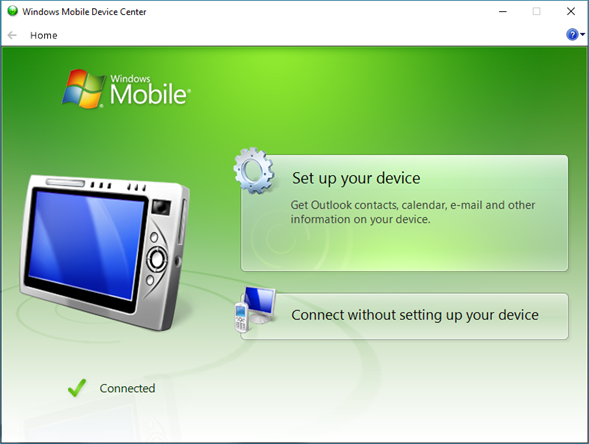 If the Windows Mobile Device Center dialog box displays, close it. Windows Mobile Device Center Setup: Click Next. If the Calibration screen displays on the scanner, press Esc on the keypad. When the Windows Mobile Device Center dialog box displays, close it. AscendScan Installation Complete: Click Finish.